Where to even begin?! 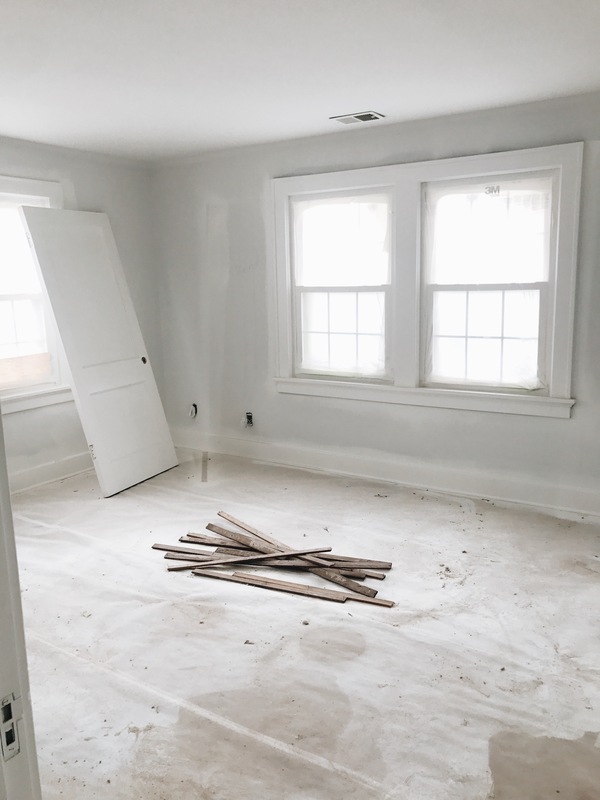 We have taken a longer break from the blog than expected, which I guess comes with the territory of moving out of state, with three kids, and finding out the day before arrival that our house was in no condition to move into. Which meant living in a hotel (with a stomach bug + only enough clothes for an overnight stay while the rest of our stuff was on the moving truck) for six days with three kids. There are no words. 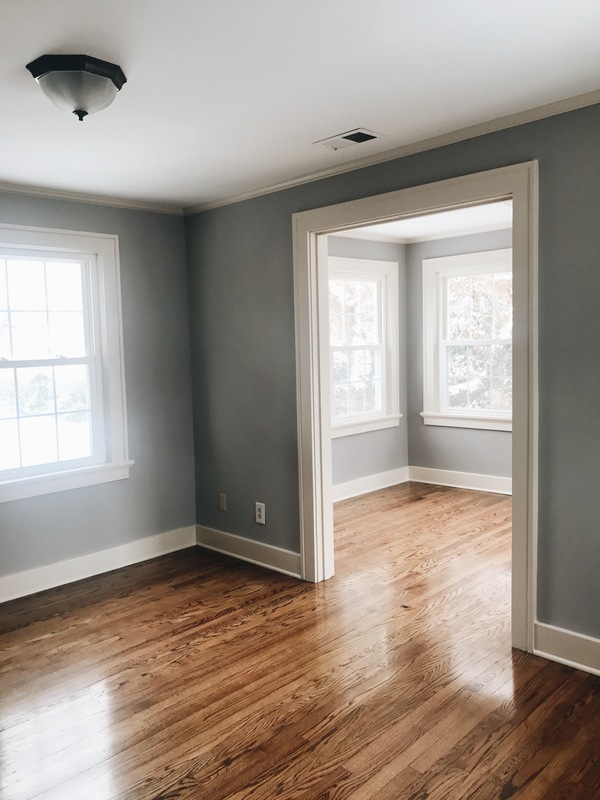 We’ll start with a few pictures of the house when we bought it, I am dying to share what things look like now but thought it would be most fun to start at the beginning and then we can slowly go room by room!! Let’s back track to when we closed on the house. During inspections, we found out that the home had all old knob & tube electrical, if you know old houses, you know this can be a huge problem & it was something we needed to have addressed. The sellers agreed to pay to upgrade the electrical, but not until closing. 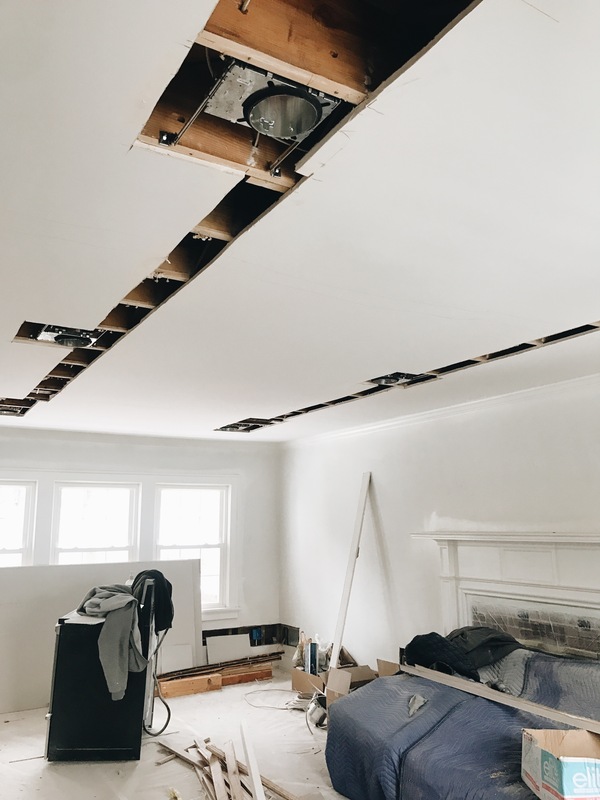 It turned out to be much more of a project than we thought, almost every single wall & ceiling in the house needed to be opened in order to replace the wiring, followed by extensive repairs. 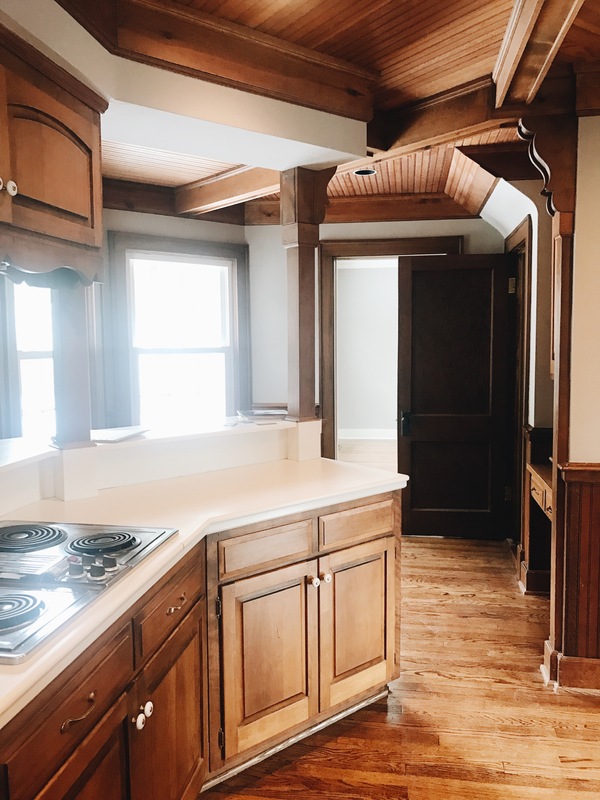 Our electrician & contractor got started immediately after we got the keys, and we had them go ahead and take down the upper cabinets & soffits to give us a clean slate for planning for an eventual kitchen renovation. 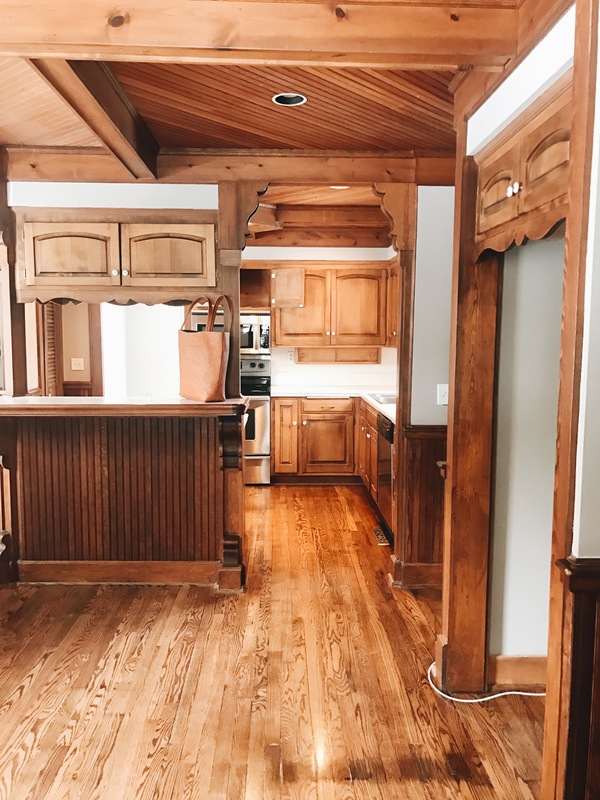 The owners updated this kitchen at some point in the 80s or 90s, so our goal is to bring it back to the feel of what the original kitchen would have looked like but with all of the modern upgrades. I am loving all of the symmetry that I can see in this room that was definitely hard to envision before!! The kitchen walls & ceiling are now fully repaired, new recessed lighting is installed & all of the electrical has been finished. We also moved the bathroom door that was right next to the sink (weird) to around the corner to help expand the length of the kitchen working area & also make the bathroom more functional. 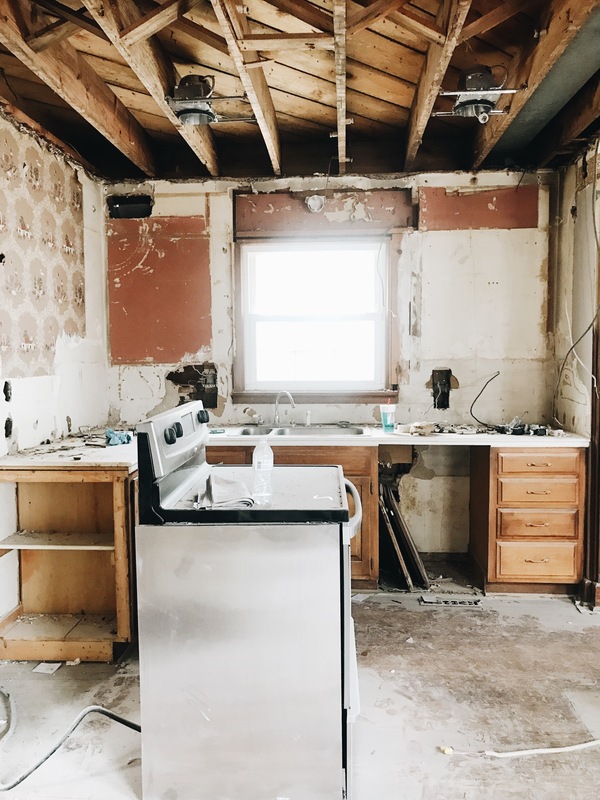 You can definitely tell that a fridge was an afterthought in this kitchen as were lots of older homes, as the fridge sits almost all the way down into the eating area. I will share more of the kitchen plans & drawings soon! 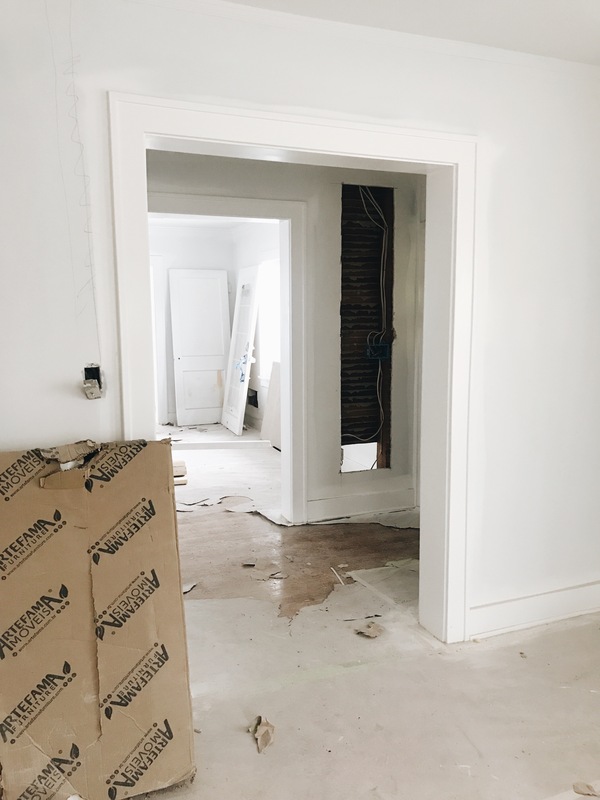 The hardwoods are in great shape, they are taped over in the below pictures because these were taken during painting, but we had our crew run the hardwoods into the mudroom & office instead of the tile & carpet, while the rest of the demo was taking place. We are sooooo excited to finally be moving in & sharing lots more pictures & updates soon. It has been a wild ride, but this feels more like home than any other house we have lived in!!!! Thanks for bearing with us for the last two weeks, hope you all had an amazing Easter with your family & friends!!! Oh, girl! 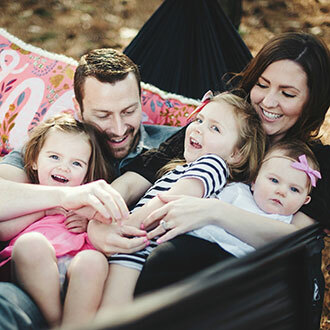 The first paragraph of this posts trumps every mom sob story… ever! You’re my hero. These pictures are so exciting. Your house already looks so charming. I can’t wait to see what you guys do with it! Can’t wait to see how the renovations unfolds! Serious house envy right now! It looks so beautiful!! There must be something about a big move and stomach bugs. We moved from Michigan to Oklahoma and everyone ended up with the stomach bug for the next week. Gah! Glad you all are moving in the right direction. I just love how you took this leap of faith! It’s truly meant to be! 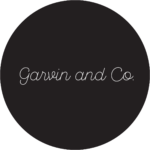 Happy renovating, Garvins! You will make this the home of your dreams! Oh my gosh! What a nightmare! I’m so glad things are starting to look up! Can’t wait to see the progress and finished product! So excited to see the transformation! Love all the historic details and wood textures. THIS IS THE BEST EVER!!!!!! 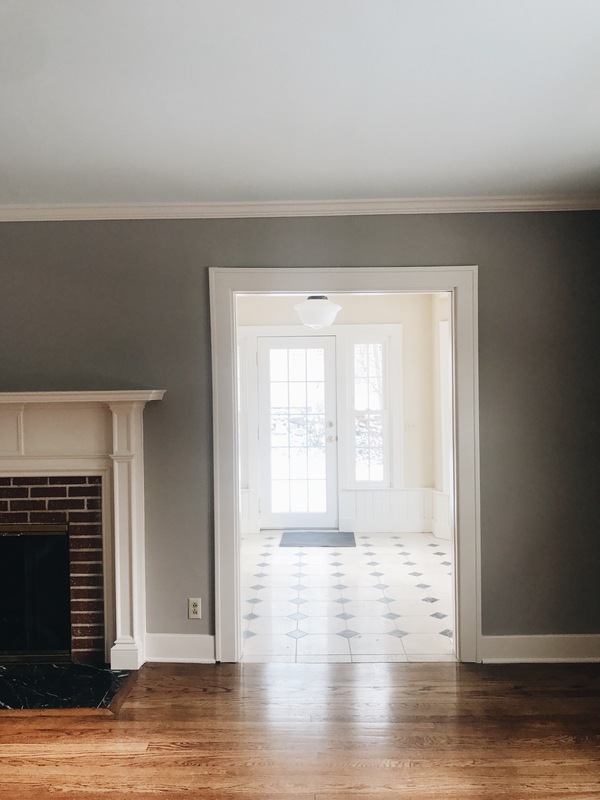 I am so excited to watch you bring back some life into this beautiful home! How exciting! Can’t wait to see all the pictures as you update! Your house looks adorable! Can’t wait for the official tour! Oh my goodness, you are a trooper! But I bet it will be so worth it, can’t wait to see more pics! What a great find!!! It’s so cute and I’m sure you are going to make it look even more AMAZING! Yikes about not being able to move in and having to have such a crazy week, nothing ever seems to go smoothly with buying a new house and adding a bunch of little ones even makes it so much harder!! Can’t wait to see the finished product. Does the kitchen have 2 ranges?! Wow! I can’t wait to see the finished product! Kind of off topic but how did your minivan treat you on this cross country trip? Still the best decision? I’m thinking of getting one! Ooh my goodness, I have not checked in on you in soooo long, and that was such a super fun surprise!! I cannot wait to see more pictures of this new house!! You will make it beautiful!!!!!!!! xoxo! Can’t wait to see the progress and finished product. I am curious…are you doing the IKEA kitchen cabinets again? We lived in Kansas City for several years! Tornado warnings are a regular occurrence, but most people who have lived in KS/MO their entire lives haven’t seen a tornado. Only once in our time there did we have to take our dental patients to the basement and hunker down for awhile. No touchdown happened though! It’s going to be so beautiful! I cannot wait to see the finished product and all the in between! It’s beautiful!! 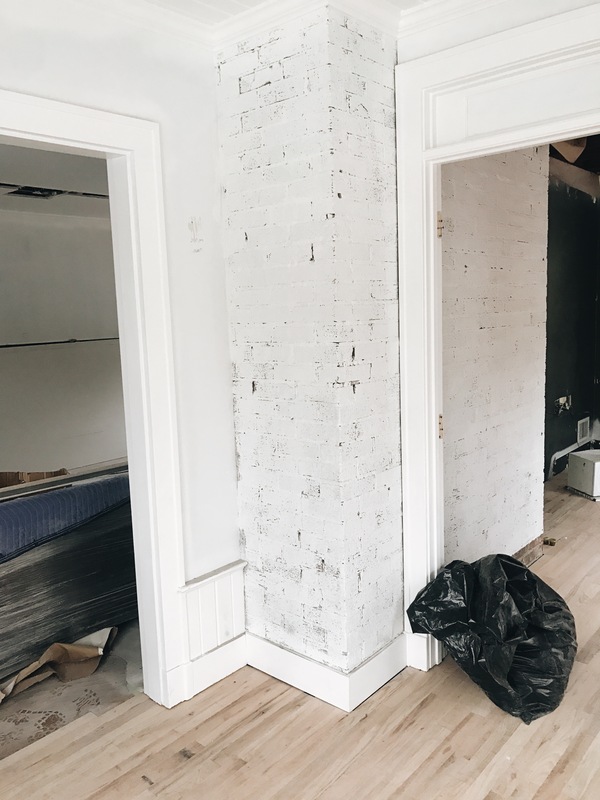 So excited to see you transform another house with your beautiful style!! Hey there! 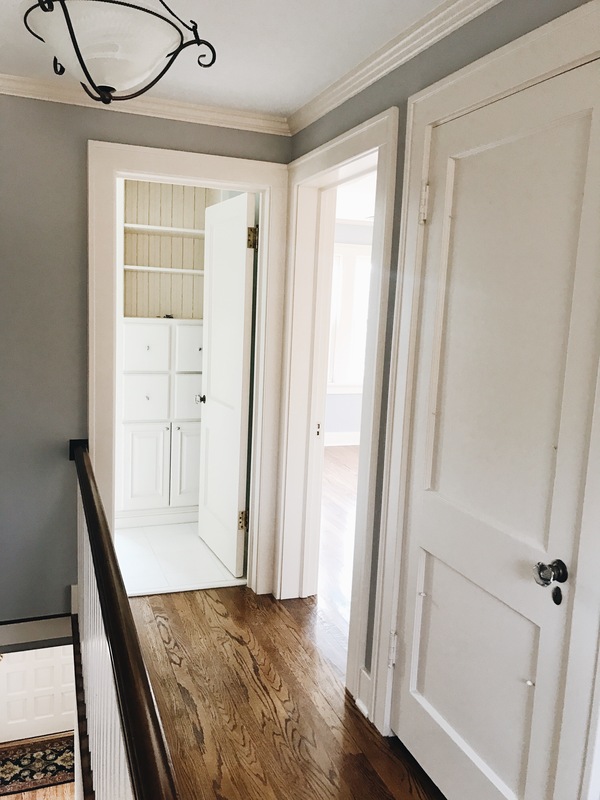 I love these paint colors and am doing a reno myself similar to yours. 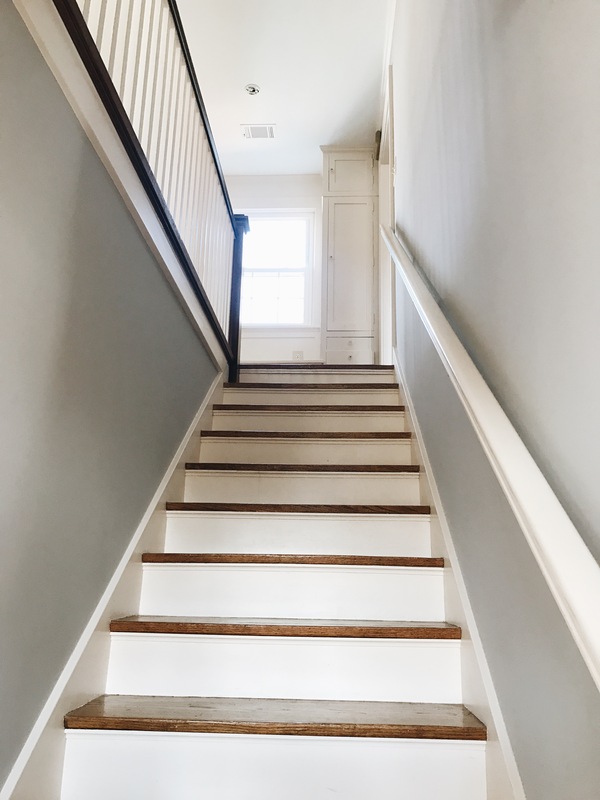 Could you please share what paint colors you’re using? Thank you!